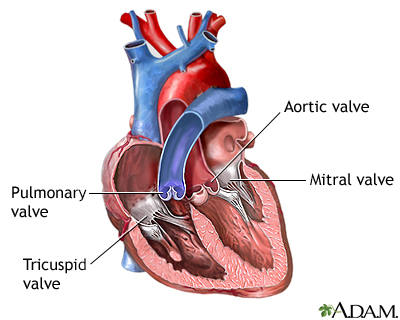 A heart murmur is a blowing, whooshing, or rasping sound heard during a heartbeat. The sound is caused by turbulent (rough) blood flow through the heart valves or near the heart. The heart has valves that close with each heartbeat, causing blood to flow in only one direction. The valves are located between the chambers. Murmurs are classified ("graded") depending on how loud the murmur sounds with a stethoscope. The grading is on a scale. Grade I can barely be heard. An example of a murmur description is a "grade II/VI murmur." (This means the murmur is grade 2 on a scale of 1 to 6). When a murmur is more noticeable, the provider may be able to feel it with the palm of the hand over the heart. This is called a "thrill". Does the murmur occur when the heart is resting or contracting? Does it last throughout the heartbeat? Does it change when you move? Can it be heard in other parts of the chest, on the back, or in the neck? Where is the murmur heard the loudest? Many heart murmurs are harmless. These types of murmurs are called innocent murmurs. They will not cause any symptoms or problems. Innocent murmurs DO NOT need treatment. Multiple murmurs may result from a combination of heart problems. Have other family members had murmurs or other abnormal heart sounds? Do you have a family history of heart problems? Do you have chest pain, fainting, shortness of breath, or other breathing problems? Have you had swelling, weight gain, or bulging veins in the neck? Does your skin have a bluish color? The provider may ask you to squat, stand, or hold your breath while bearing down or gripping something with your hands to listen to your heart. Fang JC, O'Gara PT. History and physical examination: an evidence-based approach. In: Zipes DP, Libby P, Bonow RO, Mann DL, Tomaselli GF, Braunwald E, eds. Braunwald's Heart Disease: A Textbook of Cardiovascular Medicine. 11th ed. Philadelphia, PA: Elsevier; 2018:chap 10. Nishimura RA, Otto CM, Bonow RO, et al. 2017 AHA/ACC Focused update of the 2014 AHA/ACC guideline for the management of patients with valvular heart disease: a report of the American College of Cardiology/American Heart Association Task Force on Practice Guidelines. Circulation. 2017;135(25):e1159-e1195. PMID: 28298458 www.ncbi.nlm.nih.gov/pubmed/28298458.